Do you have Patellofemoral Pain Syndrome (knee pain)? If you have Patellofemoral Pain Syndrome (bad knee pain), and you want it gone ASAP, read this article to find out how I fixed mine all by myself, without surgery, without pills, without braces or taping, without injections, without extended periods of rest, without intense, complicated workouts. I went to my doc and told her I had bad knee pain. I told her my knees would also sometimes just give out, unexpectedly. One of them would just suddenly buckle under me and wouldn’t be able to support my body. THERE WAS NO WAY I was giving up running (and walking and hiking) - I love it too much. THERE WAS NO WAY I was getting surgery for this. Too expensive, too risky, too scary. But, I did need to do something, because the pain was getting really bad. It was there throughout the day, and worse when I would sit for an hour or more, and it was excruciating when I climbed stairs, and when I ran. For three weeks in a row, I couldn’t run at all. For years, I’d been running every other day, and I really looked forward to each run. SKIPPING MY RUNS MADE ME VERY UNHAPPY. I had to tell my wife that I couldn’t join her on our nightly walks around the neighborhood, because my knees hurt too much. My running and my walks with my wife are a BIG DEAL for me - they bring a lot of joy, fulfillment and energy into my life. And the persistent pain in my knees was starting to make me pretty miserable (my wife can attest to that). So, I had to get this condition sorted out, quickly. I told my doc I would go try out the physical therapy. I went to the physical therapist and she gave me a bunch of exercises. She also suggested I buy and wear a knee brace, and she showed me how to tape up my knee, all of which, she said, should help with the pain. Are we treating the symptoms (the pain)... or are we treating the cause, so we can actually eliminate this condition, so I can get back to my life? In spite of my apprehension, I followed her instructions to the letter - I did the exercises, I bought the knee brace and started wearing it, and I learned how to tape up my knee. I still had terrible pain in both knees. I still couldn’t go running. I still couldn’t go for my nightly walks with my wife. Annoyed, I went back to see my doc. After I told my doc that physical therapy didn’t work, she said the only other options were what she suggested in the first place: give up running and surgery. Now I was even more annoyed, because I knew I wasn’t going to do either of those things. I started feeling like I was running out of options. I went into medical research nerd mode! If you don’t know me yet, my name is Rick Kaselj. I earned my Master’s Degree in Exercise Science, I’ve been a Kinesiologist, and injury and pain expert since 1994, I have 23 years of hands-on experience working directly with clients, and I have personally scrutinized hundreds of medical research papers and studies related to injuries and pain relief. And that’s what I did for my Patellofemoral problem - I hit the books (the medical research journals, studies and papers). 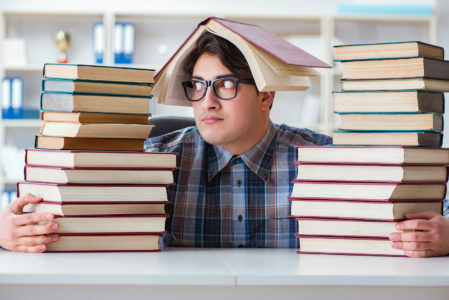 What I found “hidden” in these journals and studies gave me a different perspective on Patellofemoral Pain Syndrome, and it explained why my experiences with my doctor and physical therapist were so frustrating. NO CURE. I think many doctors and physical therapists believe Patellofemoral Pain Syndrome can’t be cured, it can only be “managed,” and this is why they employ a “let’s treat the pain and the symptoms” approach, instead of a “let’s cure this” approach. And I think the rare exceptional doctors who do believe it can be cured, default immediately to surgery as the only way. In many cases, it wasn’t the knee that was causing this condition, it was the muscles that surround and support the knee. So, armed with this information, I set out to create an exercise program for myself that would heal and strengthen the muscles that surround and support my knee. But, I knew it would have to be a certain type of program, or else, knowing me, I wouldn’t stick to it, and wouldn’t get the results I wanted. would be staged, so I could gradually heal and strengthen the muscles that surrounded and supported my knees, because I knew from my previous experience with other injuries, and working with clients, that staged, progressive exercise programs are the safest and most effective way to recover, and reduce and eliminate pain. After several attempts at designing and testing the program, I finally found something that worked. After a few weeks of doing the program, my pain had decreased significantly, and I was back to my runs, and my nightly walks with my wife - which made me very happy! I continued doing the exercise program, and after three or four more weeks, my knee pain and my Patellofemoral Pain Syndrome were gone, and they haven’t come back since! I was obviously excited about the results I got, and it gave me a huge part of my life back… so naturally, I wanted to start sharing this program with my clients. It didn’t work for everyone - nothing in life does, but many of my clients were able to decrease their pain significantly or altogether, and get back to their running, walking, sports, hobbies, and active lives. There’s the hard way, and there’s the easy way. The hard way is: find and read all the research related to this condition, and then create your own exercise routine that actually works, and will be short and easy enough to make sure you actually do it every day for at least a few weeks. The easy way is: save yourself all the headaches of doing the research and designing the exercise program to perfection (which took me a long time! ), and just get my Patellofemoral Syndrome Solution program. You can test it out for 60 days with absolutely no risk - and get all your money back if you don’t love the results you get. It’s a video exercise program that you can do at home, completely on your own, that’s designed specifically to strengthen and heal the muscles that surround and support your knees, so you can eliminate your Patellofemoral Pain Syndrome and get back to the pain-free, active life you love! This program is based on scientific and medical research related to Patellofemoral Pain Syndrome, and it is designed to be comprehensive, but also easy to learn and easy to do, so you will definitely do it! The videos in the program show you how to do each and every exercise perfectly, in exactly the right sequence, with exactly the right number of reps and sets, all laid out for you, in explicit detail. 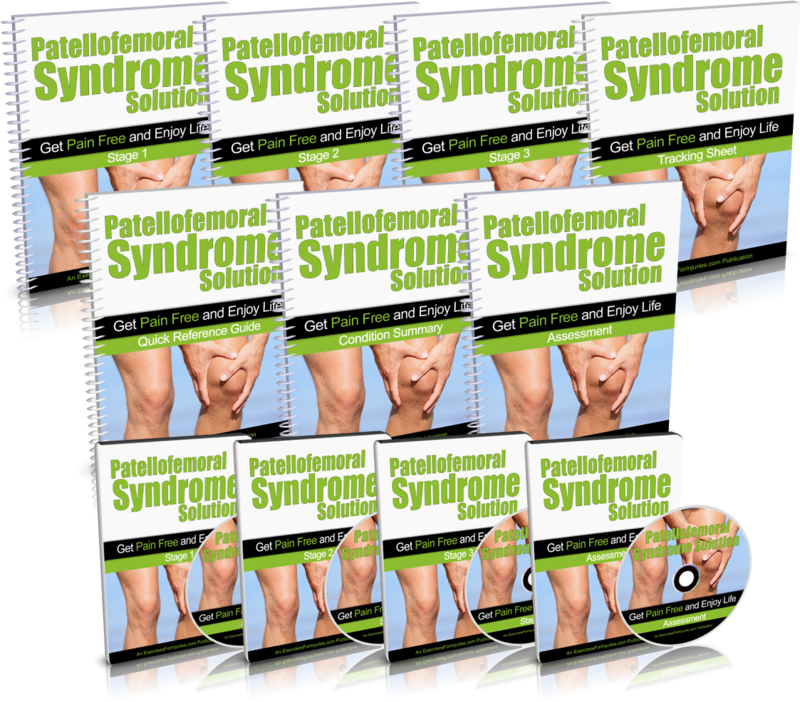 CLICK HERE NOW to order the Patellofemoral Syndrome Solution program for just $37! My team and I have just finished COMPLETELY UPDATING the Patellofemoral Syndrome Solution program. We shot all new videos, we created all new manuals, we added more resources like cheat sheets, reference guides and tracking sheets, and lots more! THE NEW PROGRAM IS AWESOME! 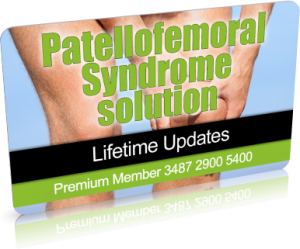 After the first 100 people order, the price for Patellofemoral Syndrome Solution goes back up to $57. This is not just a bunch of exercises thrown together with the HOPE that they will relieve your pain. This is a CAREFULLY DESIGNED SYSTEM that has already helped me and my clients decrease and eliminate Patellofemoral Pain Syndrome and knee pain. I didn’t just make up this program. It is the result of YEARS OF SCHOLARLY MEDICAL RESEARCH and feedback from REAL-WORLD TESTS AND EXPERIMENTS ON MYSELF AND WITH CLIENTS. 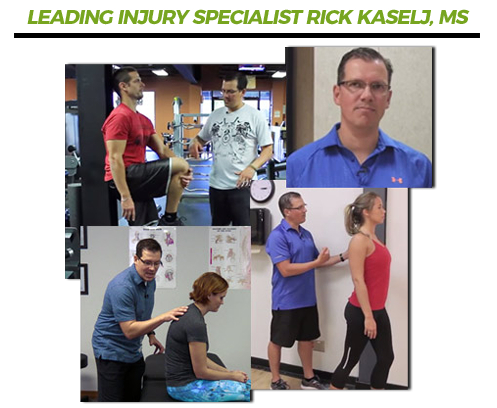 Below is a description of exactly what each component of the program is and how each helps get you to your end goal >>> FAST REDUCTION AND ELIMINATION OF YOUR KNEE PAIN and the ability to get back to running, hiking, walking, sports, hobbies and the active, engaged life you had before this! It’s very important, before you get started, to assess your current condition. This is the first thing I do every time I see a new client with Patellofemoral Pain Syndrome. We need to understand how much pain you’re experiencing now, how serious your injury is, and what range of motion you can currently handle. Having this information will prevent further injury, and help you get the best possible results, in the shortest amount of time. In this component, you get a video and a brief manual that walk you through, step-by-step, how to perform a simple self-assessment. Based on this information, you’ll know exactly where to start in the Patellofemoral Syndrome Solution program. When you get your Patellofemoral Syndrome Solution program, I want you to come up to speed FAST on what you need to know, so you can get started FAST, and start reducing your pain FAST! So, I’ve distilled the educational content down to the most important summary points you need to get going right now. In this Quick-Start Cheat Sheet, I explain, in plain English, what Patellofemoral Pain Syndrome is, what causes it, what the common symptoms are, which activities make it worse, and some important tips for healing it fast. Patellofemoral Syndrome Solution is a comprehensive program of gentle, yet highly-effective stretches and exercises designed to reduce and eliminate your knee pain quickly, so you can get back to your normal, active life. First… don’t be scared or overwhelmed by the fact that this exercise program has 3 stages. If you follow the instructions and do just the Stage 1 exercise sequence, which will only take 13 minutes each day, you should feel a significant reduction of your knee pain within 7 days. I want to help you completely eliminate your Patellofemoral Pain Syndrome and knee pain, and I’m giving you a comprehensive 3-stage exercise program so you have the best possible chance of that actually happening. ...so you can do it consistently, until your knee pain is healed for good. As mentioned above, for each of the 3 stages in the Patellofemoral Syndrome Solution program, you get an instructional video, a follow-along video, and a comprehensive manual. 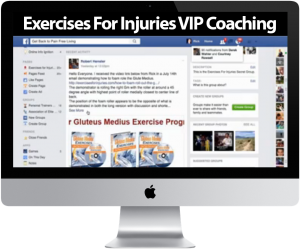 As a Patellofemoral Syndrome Solution customer, you get FREE LIFETIME ACCESS to my Exercises For Injuries VIP Coaching Group. In this group, you can get all of your questions answered by my team of health and fitness experts. You’ll also get support, accountability and inspiration that isn’t always available in your own life. Support, accountability and inspiration are critical to ensuring that you follow through on the Patellofemoral Syndrome Solution program, so you can reduce and eliminate your knee pain and get back to the life you had before this. FACT: Most people who buy exercise programs like this never actually do them on a consistent basis! No problem. You don’t have to join a gym, or buy any equipment to do the Patellofemoral Syndrome Solution program. All you need is your body and a few household items you can buy at any hardware store, or on Amazon.com. No problem. 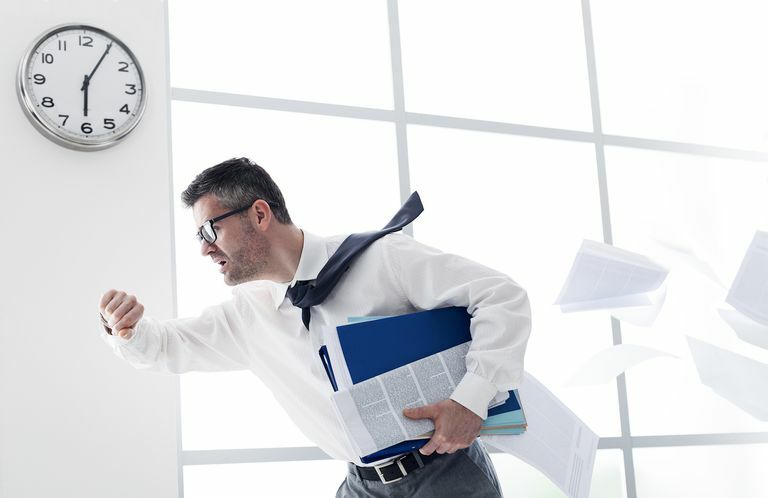 I designed this program so you could complete it in 13 minutes (or less) every day. This, combined with the fact that you don’t need a gym or any equipment, might make this the most convenient exercise program ever! Most of my clients don’t want that either, which is why the duration and intensity of this program (which you can easily adjust if you choose to) are designed not to exhaust you, but just gently stretch, lengthen, strengthen and relax the muscles that surround and support your knees. You won’t even break a sweat doing this program! 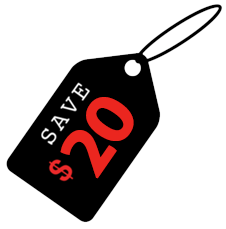 You save money. You won’t need expensive therapy appointments, training sessions, courses or seminars. These videos alone will decrease and eliminate your knee pain and Patellofemoral Pain Syndrome, and they're very affordable! 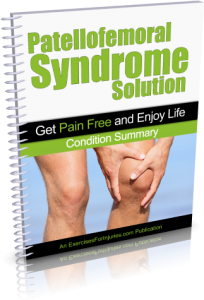 Anytime the Patellofemoral Syndrome Solution program is updated, you will receive a free copy of the new version. If you’re NOT getting the results you want, please contact us at (888) 291-2430 or support@ExercisesForInjuries.com. When you do, my team will immediately issue you a full refund. 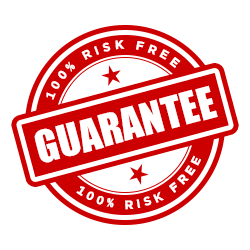 Why do I offer a 60-day, 100% money-back guarantee on Patellofemoral Syndrome Solution? To show you how confident I am in this program. This program is based on real scientific studies and research. It includes exercises, movements, and sequences that you won’t find anywhere else. And it works. This program has already worked for me and many of my clients. I want you to know that you have no risk, so you can get this program and use it with peace of mind. I want you to be focused on learning and doing the easy, gentle movements and stretches in this program so you can reduce and eliminate your knee pain. I don’t want you to have to worry about whether it’s going to work, or whether you’re going to lose out, or anything like that. With my 60-day guarantee, you can put your mind at ease and just focus on doing the program and getting better. If you do nothing different... in 30 days, you’ll probably still have miserable knee pain. And you’ll probably still have to avoid running, hiking or walking, and most other sports or activities. You may find it difficult to play with your kids or grandkids, and just sitting for an hour or more will probably be very painful. 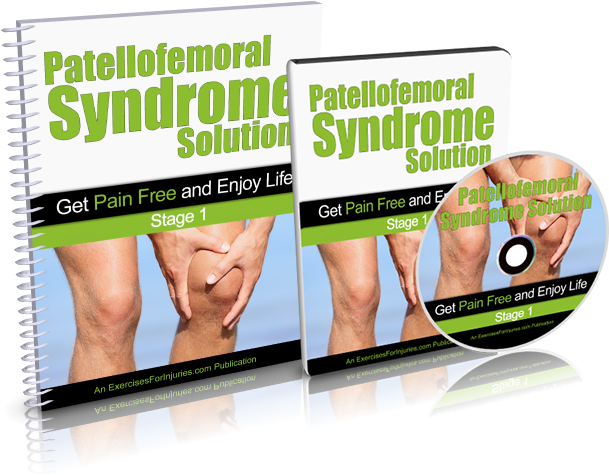 If you try my Patellofemoral Syndrome Solution program for 60 days, with absolutely no risk (it comes with an unconditional 60-day, no-questions-asked, 100% money-back guarantee), I am 98% sure that in just 30 days, you will see some VERY DIFFERENT results, and you will be feeling A LOT BETTER. ...to see if my program could REDUCE OR EVEN ELIMINATE YOUR KNEE PAIN FOREVER? I was surfing around the Internet and found a bunch of exercises for Patellofemoral Pain Syndrome. Will these help? 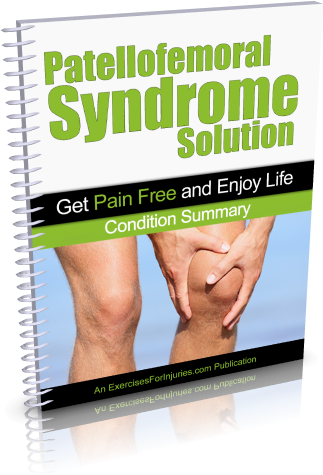 You can definitely find exercises for Patellofemoral Pain Syndrome online. But you won’t find a complete program designed to heal and strengthen not only the knees, but also the muscles that surround and support the knees, which in many cases are the primary cause of Patellofemoral Pain Syndrome. You won’t find a whole program that has been carefully crafted, based on scientific research and real-world testing, that includes ONLY the necessary exercises, with instructions on how to do them in just the right sequence, with the right number of reps and sets. That’s exactly what Patellofemoral Syndrome Solution is. Each exercise session in this program is designed to take around 13 minutes to complete. It may take a little longer in the beginning as you’re learning the stretches and movements, but you’ll have it down to 13 or 14 minutes in no time because these sequences are easy to learn. The power of this program is not in the actual exercises or stretches you do, but in WHICH ones you do (and which you don’t), the ORDER in which you do them, and HOW you do them… all of which I demonstrate step-by-step in careful detail in the program. Yes, and no. Most fitness and health professionals take a shotgun approach to exercises for injuries. They keep giving you more and more exercises, hoping they will help. I don’t do that. My program only includes the exercises you need. I also recommend you do them in a specific sequence and I give you precise instructions on how many repetitions and sets you need to do. My program has been carefully designed, based on scientific research and real-world testing, and it is a SYSTEM that has already worked for other people. There will be no guesswork or confusion on your part – everything is laid out and easy for you to follow. My best advice is for you to stop all of the other exercises you are doing, and focus only on the Patellofemoral Syndrome Solution program for at least the next 14 days. I’ve been told that I need to strengthen my knees to heal my Patellofemoral Pain Syndrome - is that true? Strengthening your knees is important, but it’s not the only thing you need to do. In many cases, Patellofemoral Pain Syndrome is caused by injury and weakness in the muscles that surround and support the knees, so you will need to strengthen and heal these muscles as well. And it’s important to work on muscle endurance as well. Something many people don’t realize is that a strong muscle does not necessarily mean it is a muscle with good endurance, and good endurance is crucial for injury recovery and prevention. There are no DVDs – we won’t be sending you anything in the mail. This is a digital video product, which means you can access everything online at our secure download web page. You get access to this download web page and everything in the Patellofemoral Syndrome Solution program (all the videos, manuals, cheat sheets, and trackers) immediately after you order. You can immediately download everything onto your computer and get started right away. No waiting for anything in the mail. A brief overview of Patellofemoral Pain Syndrome. You’ll learn what it is, what causes it, what the common symptoms are, which activities make it worse, and some important tips for healing it fast. Get your questions answered by Rick Kaselj and his team of health and fitness experts and get valuable support, accountability and inspiration. will get the special discounted price of $37. After that, the price goes up to $57. 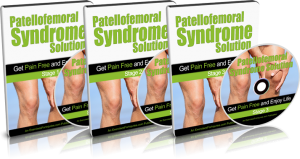 NOTE: The Patellofemoral Syndrome Solution program is a set of 7 downloadable videos, and 12 PDF files. No physical products will be shipped. After you order, you will get INSTANT ACCESS to download the videos and PDF files. The PDF files can be viewed on Mac or PC. The video format is M4V which can be viewed on Mac or PC. If you have any questions or need help, you can contact us at support@ExercisesForInjuries.com.